Yours, 1949, 96 minutes, Black and white. Clark Gable, Alexis Smith, Audrey Totter, Wendell Corey, Barry Sullivan, Edgar Buchanan, Margery Rambaugh, Frank Morgan, Mary Astor, Richard Rober, Darryl Hickman, William Conrad, Leon Ames. Directed by Mervyn Le Roy. 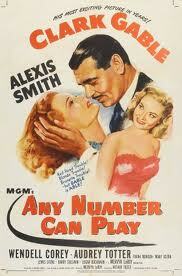 Any Number Can Play is a story about gambling. It is a star vehicle for Clark Gable as he began to build his career after World War II and his previous success. In many ways he is certain 20th-century Rhett Butler in this film, longtime married to his wife, Alexis Smith, worried about relationship with his son, Darryl Hickman, getting a bad diagnosis of his health from his doctor, Leon Ames. He has been in partnership fifteen years with friends in the casino. The film shows life at the casino, a range of clients including Frank Morgan, Mary Astor, Margery Rambaugh. Audrey Totter is his sister-in-law and her husband, Wendell Corey, is a weak character who works at the casino and is threatened by two mobsters, Richard Rober and William Conrad. The film has high-class MGM production values and was directed by Mervyn Le Roy who had began at Warner Brothers was gangster films and moved to MGM for more plush dramas. 1. An old-style MGM drama from the 1940s? Story, style, production values, cast? 2. Clark Gable at this point of his career? His post-war performances? The type of character? 1940s Rhett Butler style character, gambling, charity, relationship with his wife, wanting the love of his son? 3. Black and white photography, production, homes, the casino, the streets? The musical score? 4. The Casino story, Charlie, his partners, 15 years of success, their characters, collaboration with Charlie, friendship? The importance of Clayey as part of this group? His service of 15 years? The range of clients, concerns about Charlie’s health? Financial questions? 5. Charlie at home, his relationship with Lon, the distance between them, mutual love, Paul, his age, rebellion? Charlie puzzled about his son’s behaviour? 6. The doctor coming to the Casino, the diagnosis of angina, discussion with Charlie? Going to the home, the discussions with Lon? 7. Robbin and Alice, Alice as Lon’s sister, the touch of jealousy and her attraction to Charlie? Robin as weak, unwell, his work at the Casino, stealing small amounts, owing money, gambling? The gangsters, coming to the house, the talk, the threats, going to the Casino, the loaded dice, Robin and his fixing the throw? Charlie knowing the truth? 8. The range of clients, Jim and his brash style, his money, wanting to win, the challenge to Charlie, the underlying dislike, his big success in winning, the people watching? His decision whether to stop or continue? Charlie, coming, playing, the need for cash, the concerns, Jim and his losing? 9. Ben, his visits Charlie, his sad story, sponging on Charlie, Charlie nice, giving him the loan, the poker game, his losing, suicidal, the attempt, not killing himself, a sense of failure? 10. Sarah Calbern, the Dowager, tough, her friendship with Charlie and the owners, meeting Paul, prepared to make the phone call to her lawyer to get money and cash for Charlie? 11. Ada, her marriages, love for Charlie, the visit to the office, wanting him to leave, his not going? 12. Lon, the years of marriage, love, the distance, a concerned, discussions with Alice? Paul, going to the dance? Going to the prison, the bail? Going to the Casino, pleading with Charlie to leave, watching the game with Jim? 13. Paul, his age, bullying at school, his relationship with his father, not liking his father’s reputation, arguing with him? Going to the dance, the friends asking about his father, the fight, in jail? The owner and his speaking well to Charlie, Charlie proud that Paul was involved in the fight? 14. The gangsters, going to the home, the threats, the loaded dice? The decision to hold up the Casino, their bluff, Charlie confronting them, overcoming, shrewd, the fight, Paul and his involvement, the gangsters ousted? 15. The card game, the onus picking the card to see whether they would own it when Charlie left, Charlie and his deceiving them because he had the higher card? 16. The Casino prospering and the family going to health and happiness?